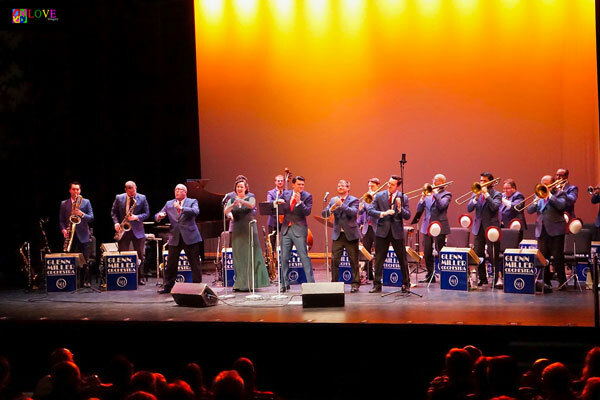 Although Friday, December 21, 2018 is the shortest day of the year, the audience of big band music lovers here at Toms River, NJ’s Grunin Center for the Arts is hoping for a long evening of classic swing and holiday tunes performed by the incomparable Glenn Miller Orchestra! 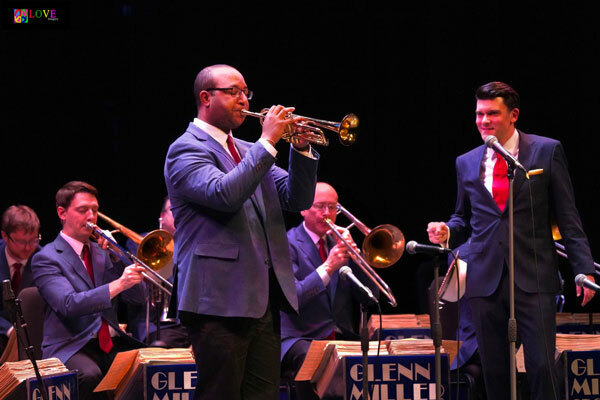 Glenn Miller was America’s #1 best-selling recording artist from 1939 to 1943, leading one of the best-known big bands in the world. Miller was born in Iowa in 1904, but as a youngster, moved with his family to Missouri. 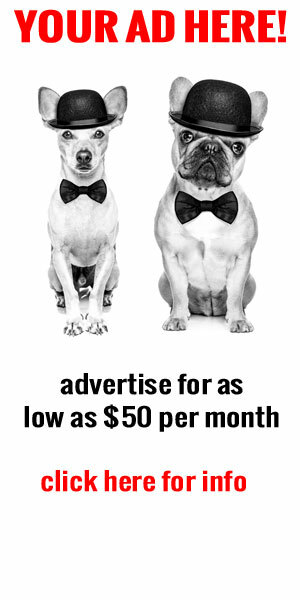 By the time he was 11, Miller had made enough money from milking cows to buy his first trombone. 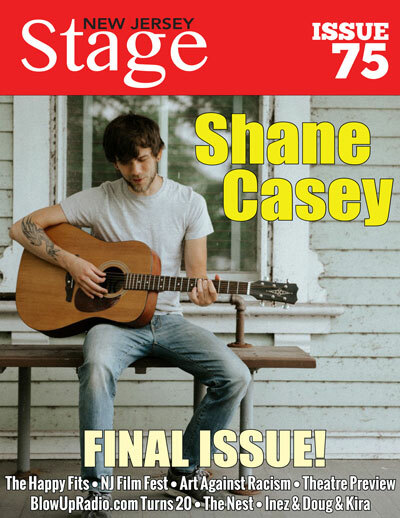 After moving to Colorado, during his senior year of high school, Miller became keenly interested in a new style of music called “dance band music.” In fact, he was so taken with it that he formed his own band with some classmates and by the time he had graduated, he decided to make his mark as a professional musician. 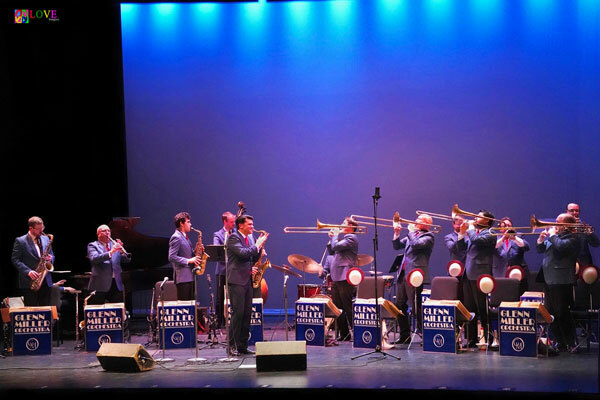 After college, Miller went to New York City where he found work as a freelance trombonist with musicians including Tommy Dorsey and Benny Goodman. After marrying his college sweetheart, Helen, in 1937, he started his own group; by 1938, however, the group had disbanded. Discouraged, Miller created a new sound where he had a clarinet and tenor saxophone play the exact same part while three other saxophones played harmony together within a single octave. With this magical combination differentiating his band from all others that existed in the late 1930s, Miller signed with RCA Victor’s Bluebird Records and produced a string of hits which included “Chattanooga Choo Choo,” which was awarded the first-ever gold record. In 1942, at the peak of his musical career, Miller decided to volunteer for the armed forces. He formed a 50-piece Army Air Force Band, which he took to the UK in 1944 and presented over 800 performances. 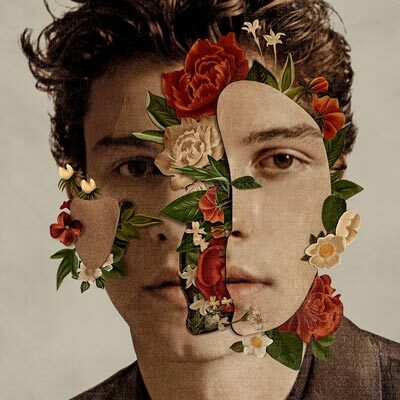 While flying from the UK to France to make arrangements to move his band there, Miller’s aircraft disappeared in 1944 in bad weather over the English Channel. His wife, Helen, accepted his Bronze Star medal on his behalf. 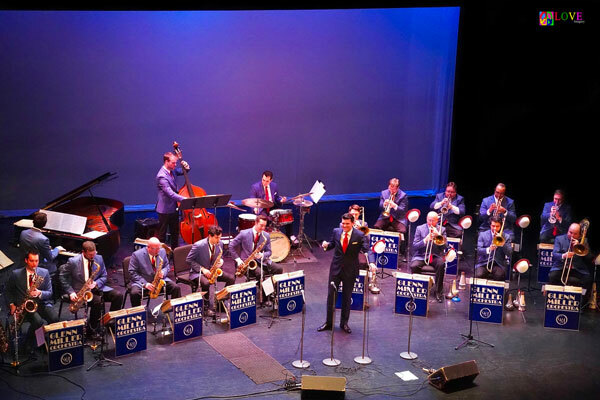 In 1946, the Miller estate authorized a band which was led by Tex Beneke; this edition of the band toured until 1950. 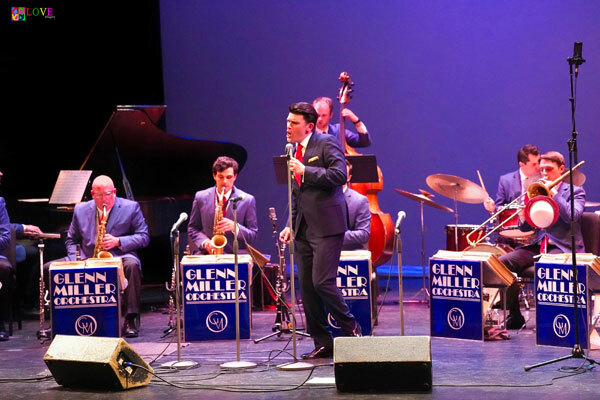 After the release of the motion picture, The Glenn Miller Story, in 1956, the Miller estate authorized yet another band, the original version of the current orchestra that still tours today. 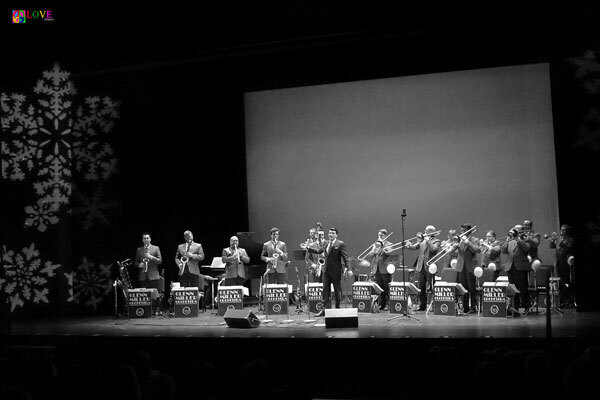 Inside the modern Grunin Center auditorium, a sold-out crowd of all ages eagerly awaits tonight’s holiday concert by the Glenn Miller Orchestra. There are adult children here with their parents, in addition to adult parents here with their children, many dressed in holiday attire — men in suits, boys in sweaters, ladies in dresses, and girls in skirts — providing a nostalgic nod back to a simpler time when swing was king! 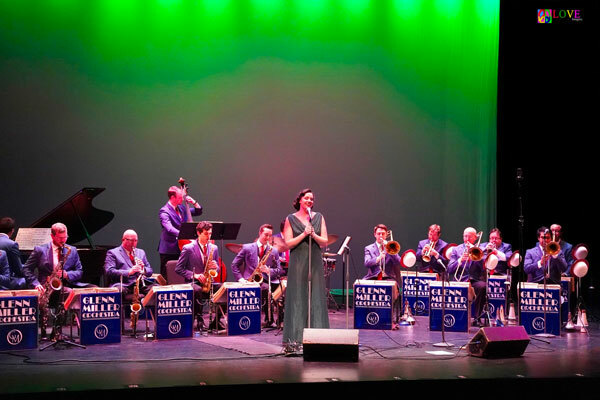 The lights dim and the 16 musicians of The Glenn Miller Orchestra file in to take their seats on stage as bandleader Nick Hilscher bows and the orchestra begins the show with a rendition of their signature song, “Moonlight Serenade,” a number composed by Miller himself. 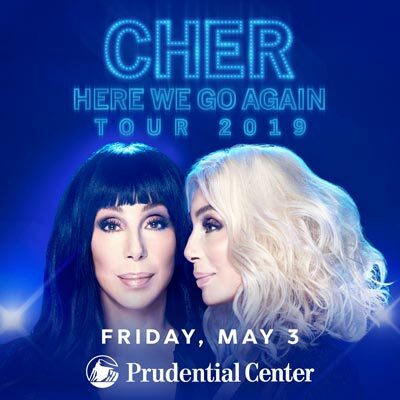 Although the group’s live performance sounds similar in nature to the Grammy-inducted 1939 recording of the tune, it is crisper, fuller, and even more alive! 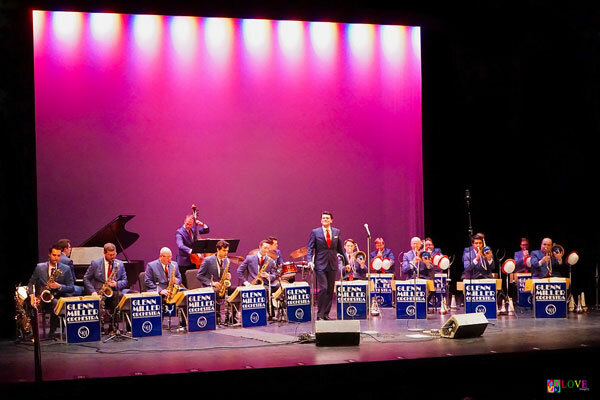 The old-time vibrato of the saxophones can be appreciated more than ever as the woodwinds contrast with the trumpets’ and trombones’ punctuating countermelody here in the comfortable Grunin Center listening environment. Counting off a jazzy version of Roy Anderson’s holiday classic, “Sleigh Ride,” Hilscher directs the band to swing! 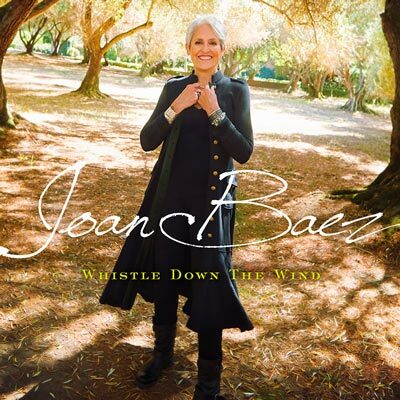 Featuring tip-top trumpet and trombone solos, the rhythm section — piano, string bass, and drums — percolates before the piece concludes with the famous trumpet “horse whinny” to great applause! The band follows up with a rendition of Miller’s 1938 #1 hit, “Tuxedo Junction,” featuring the trombone section sounding low and rumbly and waving plunger mutes as the band swings. Following avid applause, Hilscher greets the audience and introduces a song he says was written for the 1944 film, Meet Me In St. Louis. 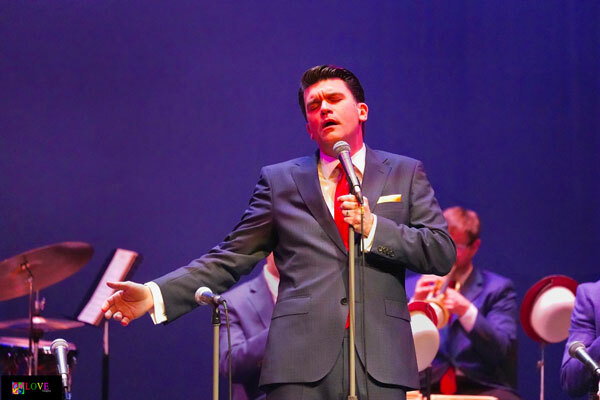 Here, he and the orchestra perform a lovely rendition of “Have Yourself a Merry Little Christmas,” featuring Hilscher’s rich voice complimented by the group’s top-notch big band sound. 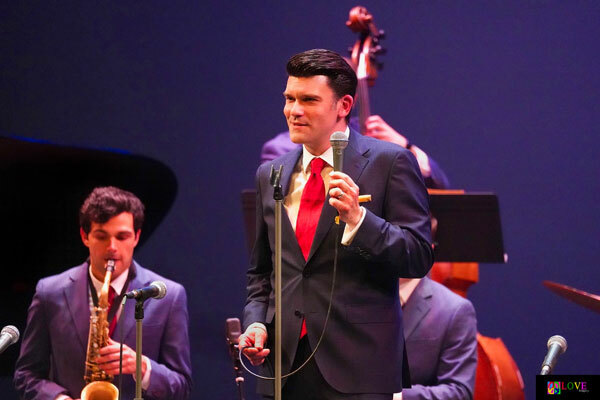 The smooth mellow tone of Hilscher’s baritone vibrato — along with the live brass and woodwind instruments — fills the auditorium with Christmas spirit and puts everyone in a holiday mood. Saxophones open “Little Brown Jug” — a rollicking swing version of the well-known 1869 folk tune — arranged for the band in 1939. In a perky rendition featuring a tenor sax solo, drummer Dean Schweiger plays bongos with his left hand as he drums with his right. 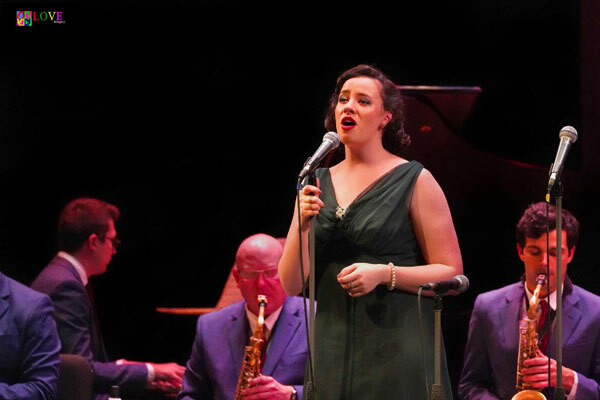 Truckenbrod continues to entertain the crowd with her lovely rendition of Mel Torme’s “The Christmas Song.” Her rich, full vocal is deftly supported by the orchestra — notably, by the trombone section which employs a nostalgic vibrato effect on their sound. Miller’s 1941 #1 hit, “A String of Pearls,” is next — the glistening saxophones opening with that infamous melodic strain which is answered by the trombones. It’s followed by a playful arrangement of “Frosty the Snowman” — featuring trombone playing the melody — with multiple solos played by various orchestra members. Moving on to Miller’s 1941 hit, “Chattanooga Choo Choo,” band leader Nick Hilscher — his hair gleaming with pomade — snaps and cues the band. Listeners enjoy the wah-wah of the muted brass and the smooth sound of the woodwinds. Singing and swinging to the infectious melody, the audience cheerfully claps along. 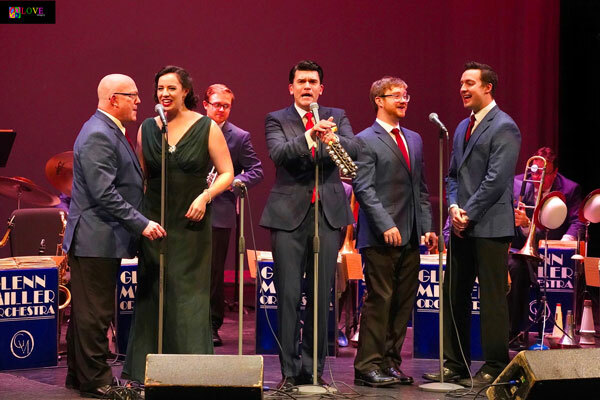 The singing group, the Moonlight Serenaders — comprised of Hilscher, Truckenbrod, and three members of the orchestra who take a break from playing their instruments to sing — croon in five-part harmony, swinging up a storm. The band stands as the singers clap and the audience joins in on this contagious feel good song! 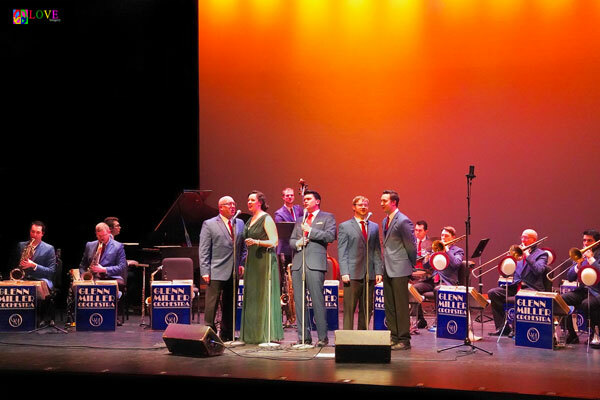 “American Patrol” is a 1942 Glenn Miller tune which combines original themes in addition to well-known American melodies like “Dixie” and “Columbia, The Gem of the Ocean.” Hilscher dedicates this number to all of the veterans in attendance at the Grunin Center who stand to be recognized. The crowd applauds for the veterans and continues to clap enthusiastically throughout this appealing number. 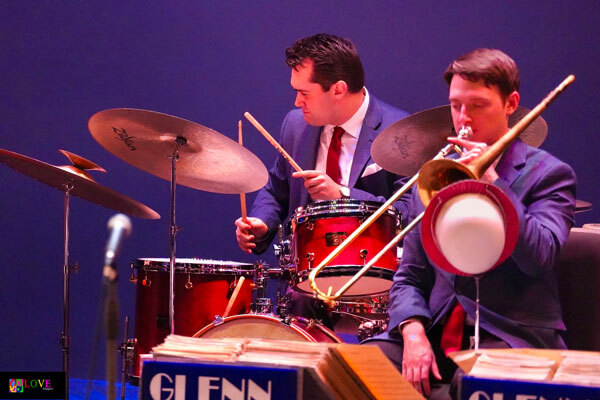 Act I ends with a performance of 1939’s “Pagan Love Song” where Dean Schweiger’s drums set a quick and breezy tempo for trombone and tenor sax solos before Schewieger plays an impressive drum solo. During intermission, we take a moment to chat about the performance thus far with several audience members including Annie and Ron from Egg Harbor City. Act II commences with a dynamic and jazzy version of “Santa Claus is Comin’ to Town,” and is followed by a nostalgic rendition of “Moonlight in Vermont.” Featuring the true Glenn Miller styled and classic vibrato sound, the number features all of the band’s talented wind players on saxophones, trumpets, and trombones. 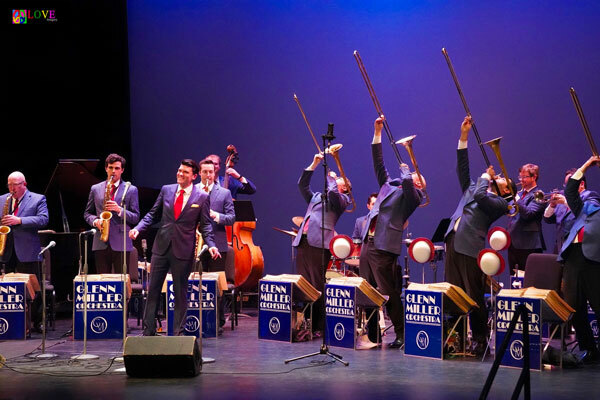 Saxes bow and trombones sway on a swinging version of Miller’s 1940 Top 5 hit, “Pennsylvania 6–5000,” complete with telephone “rings” on the cymbals and the audience vocalizing the title in rhythm along with the entire band. 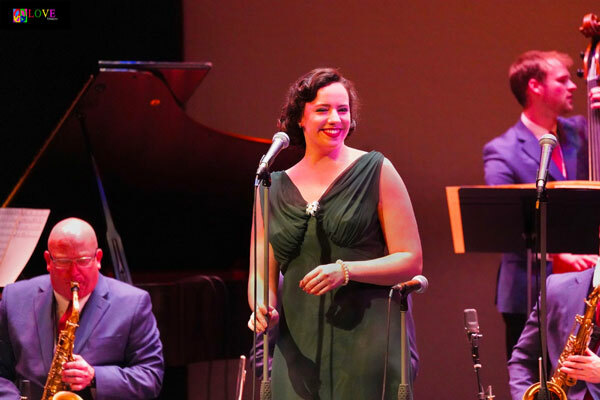 A highlight of the evening is Truckenbrod’s exceptional version of the ballad, “I’m Glad There Is You.” Sounding sweet and resonant on this lovely composition, Truckenbrod is expertly accompanied by Hilscher and his world-class orchestra. Putting everyone in the mood as they clap along to the big band sound, an older couple in the crowd starts to dance down front. As audience members hoot and holler for them, a younger couple jumps in and starts dancing, much to the delight of the crowd! Following huge applause, Hilscher and the Orchestra conclude tonight’s stroll down Memory Lane with a reprise of “Moonlight Serenade,” as band members rove about the stage playing to each of the four musicians who are leaving the group. Here, he and the group perform “Bugle Call Rag,” a brisk piece which features a fast and furious drum solo by Dean Schweiger that not only electrifies the audience, but inspires Hilscher and the band to conclude this rapid-fire number with style and showmanship! 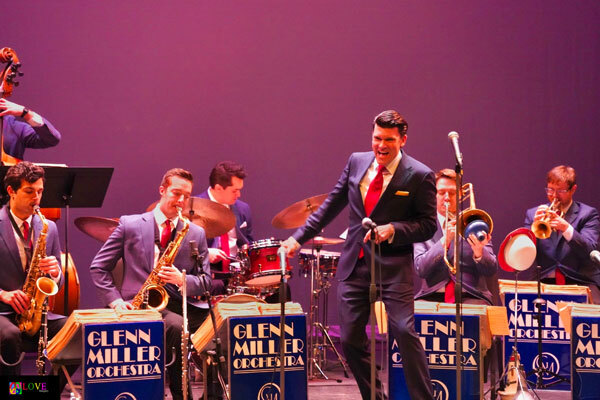 We also get a chance to chat with two members of The Glenn Miller Orchestra. And to prove the point, many of Schweiger’s family members — cousins, uncles, sisters, and brothers, and more — are here to support him. 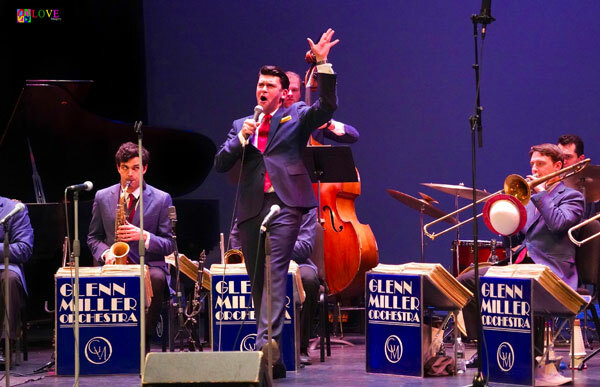 To learn more about The Glenn Miller Orchestra, please go to glennmillerorchestra.com. 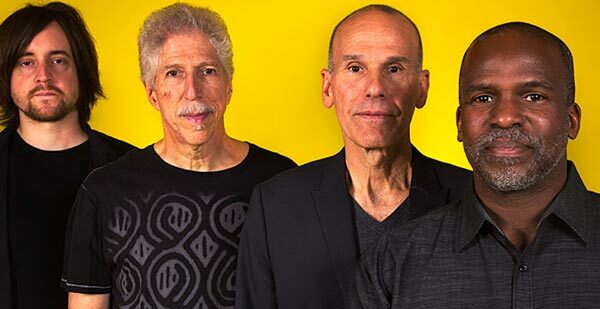 To find out about future events at Toms River’s Grunin Center — including Rickie Lee Jones on February 22, Béla Fleck and Abigail Washburn on April 5, and John Pizzarelli on April 26 — please go to grunincenter.org.